The Captain John Smith Chesapeake National Historic Trail, America’s first water-based National Historic Trail, combines the routes of Englishman John Smith’s historic voyages on the Chesapeake Bay and its tributaries in 1607-1609. The U.S. Congress designated the routes of Smith’s explorations as a National Historic Trail in 2006. The trail stretches up and down the Chesapeake Bay and its tributaries in Virginia, Maryland, Delaware, Pennsylvania, New York, and the District of Columbia. The trail was extended in 2012 to include the entire Susquehanna River south of Cooperstown, New York through Pennsylvania to Maryland. Four hundred years ago, Smith and his small crew of adventurers set out in an open boat to explore the Chesapeake Bay. They mapped and documented nearly 3,000 miles of the Bay and its rivers. Along the way, they visited many thriving Native American communities and gathered information about this “fruitful and delightsome land.” Smith only traveled up the Susquehanna a few miles, where he met the Susquehannock Indians just north of the river’s mouth. He kept detailed records of his voyage and his visit with the Susquehannocks, who lived in settlements along the river at that time. Smith’s map and writings influenced exploration and settlement of eastern North America for many generations, and they are a remarkable record of the native cultures and the natural environment of the 17th-century Chesapeake. The Captain John Smith Chesapeake National Historic Trail lets you experience and learn about the Chesapeake Bay through the routes and places associated with Smith’s explorations. The trail is administered by the National Park Service Chesapeake Bay in Annapolis, Maryland. Trail themes include the voyages of Captain Smith, the natural environment he explored, and the 17th century Indian cultures he encountered. Learn more about the Captain John Smith Chesapeake Trail and about Captain John Smith. Take a bird’s-eye view journey along the Captain John Smith Chesapeake National Historic Trail from the Columbia Crossing River Trails Center downriver to the Zimmerman Center for Heritage. The 74 mile Lower Susquehanna segment of the trail from Harrisburg, PA through Lancaster and York Counties to Havre de Grace, MD has been selected by the National Park Service for initial trail planning and visitor readiness efforts. 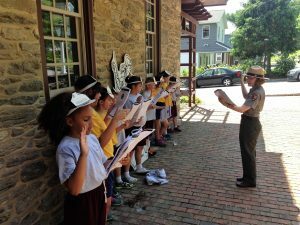 The National Park Service has engaged Susquehanna Heritage as its lead partner for these initiatives, which include the trail’s first-ever Visitor Contact and Passport Station at the Zimmerman Center for Heritage and a Segment Plan process to identify public access and storytelling opportunities along the trail. Susquehanna Heritage’s Zimmerman Center for Heritage near Wrightsville is Pennsylvania’s official Visitor Contact and Passport Station for the trail. 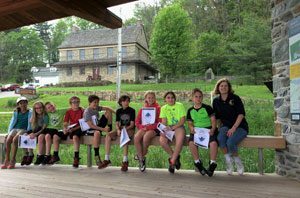 Visit the Zimmerman Center to get your official National Park Passport stamp for the trail, discover more about Smith’s travels and the Indians of the Susquehanna, and walk through the historic landscape of the last known settlement of native Susquehannocks. Many National Park areas have Junior Ranger programs, and now there is one for the Captain John Smith Chesapeake National Historic Trail at the Zimmerman Center for Heritage. Our Junior Ranger program is for ages 6 through 12. Complete enough activity pages for your age group to earn a badge and be sworn in as an official Junior Ranger for the Captain John Smith Chesapeake National Historic Trail. 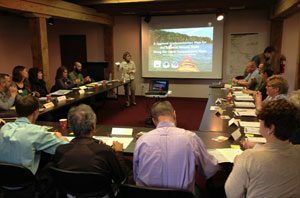 The National Park Service has engaged Susquehanna Heritage to manage development of a Segment Plan for the Lower Susquehanna portion of the John Smith Trail, from Harrisburg, PA to Havre de Grace, MD. The Lower Susquehanna Heritage Greenway is assisting with planning for the Maryland portion of this route. The primary focus of the Lower Susquehanna Segment Plan is to illustrate how the John Smith Trail can be enhanced along the Lower Susquehanna River. The plan will identify methods for making the trails more visible and meaningful for visitors and for effectively interpreting diverse stories. The plan will also propose varied and compelling hands-on experiences to develop the trail and adjoining landscapes as educational, recreational, and tourism assets for the region. Opportunities for the Star-Spangled and Washington-Rochambeau National Historic Trails, which traverse the river in Maryland, will also be explored in the plan. Learn more about John Smith Trail Planning.